In an ideal world, every school commute could be done on a bike path and every grocery store would be on a road with a protected bike lane. In reality, most of us who bike with our children have to share roads with cars. Despite our best efforts to choose the safest routes, eventually, we end up on a street that is less than ideal. Fortunately, there are steps that we can (and should) take to keep our children as safe as possible. There is no such thing as no-risk cycling (just as there’s no such thing as no-risk driving), but it is possible to keep the risk at an acceptable level. 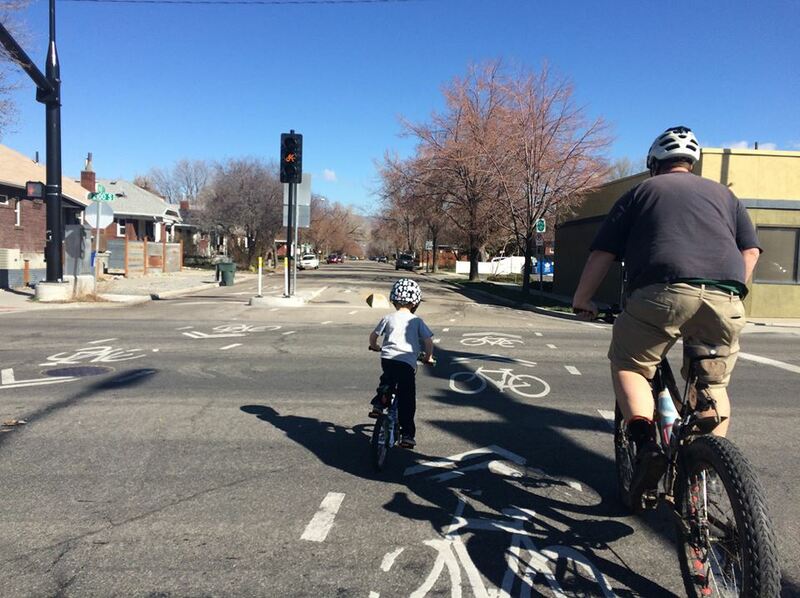 Here are our top tips for biking with kids in traffic. Predictability is key for biking in traffic, but unfortunately, children are unpredictable. They swerve without warning. They stop suddenly. For this reason, we suggest taking over control when biking with younger children in higher-traffic areas. This means using a tow-bar like the Follow-Me-Tandem to keep them tucked safely behind you, or a trailer or cargo bike to haul them and their bike until getting to a safer stretch of road. Where you ride in relation to your child can go a long way toward protecting them. Ideally, you are riding with two adults who can ride both in front and behind the child (or children). If you are riding solo with your child, things are a little trickier. Generally, I recommend riding slightly behind and to the left of your child to help protect them from traffic coming from behind. This also ensures you don’t accidentally get too far ahead of them. Don’t be afraid to take the lane or ride further to the left than you normally would; do whatever it takes to physically block your child from traffic. Although I usually prefer riding behind or to the side, there are times you may want to ride in front and have your child follow from behind. If you are riding in an area with lots of side roads, intersections, or driveways, you may want to position yourself first to control speed and look out for merging traffic. Many children also do better when following/copying mom and dad than taking verbal directions from behind. Don’t take your child on a busier road until they’ve mastered riding in a straight line, staying close to the curb, and are good about following your instructions. If your child isn’t good about differentiating between right and left yet, draw R and L on their bike gloves or put a bell on their right handlebar. Practice verbal commands (“wait, slow, turn right, turn left”) and riding safely thru intersections. Stick to riding exclusively on low traffic roads and bike paths until they’ve shown they can be trusted to ride predictably and follow your directions. The more visible you can make yourself and your child, the better. Make a sign for the back of your bike (“Kids on Board”, “3 feet is the law”, etc), add flashing lights to your wheels, put reflective tape on your child’s helmet — whatever it takes to make yourself visible. One of the best ways to avoid getting into a dangerous situation is planning your route ahead of time. Use a city bike map to pick the safest route. Practice riding it ahead of time by yourself and look for dangerous or tricky spots. That’s a very good compliation of hints! I have a 4-year boy that loves to bike on street and by own experience, can’t think of a better guide. Could I translate to portuguese and post, mantaining credit? Yes, please do translate and post. A good list, thank you.